Updated Sunday July 10, 2016 by Dana Nemec. Burnt Hills United is pleased to announce that it will be partnering with local soccer Coach Keni Banda and the Banda Bola Sports Foundation. 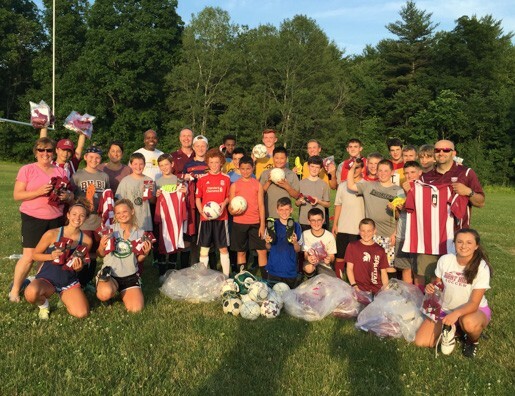 Coach Banda and his foundation take donations of “gently used” soccer equipment and package, transport and ship the equipment to the Chituka Village in Malawi, Africa. The equipment is then distributed to children within the village and surrounding areas. These children have no access to the simplest of soccer gear and must rely on the efforts of Coach Banda to play the “beautiful game”. Thank you to all of the families that helped to contribute to the amazing collection of soccer balls, cleats, indoor shoes, soccer socks, uniforms, jerseys, gear bags, etc! Coach Banda is arranging for the transport and distribution of the gear to the children in the areas that he serves in Africa. His efforts and enthusiasm for making the lives of these children better has been inspiring. Please check out his website at www.bandabolasportsfoundation.org and his Facebook page located by searching Bandabola Sports Foundation. BHU is a community organization that serves Burnt Hills and the surrounding communities. As a club, we have a wonderful opportunity to reach beyond our borders and help change the lives of children thousands of miles away.